We've just got back from an excellent week in Malta. Despite initially windy weather we had 5 days of reliably good diving, confirming Malta's reputation as a world-class dive location. We dived with Luna Diving in Mellieha Bay; a small sea-side resort in the North East of the island, with child friendly beach, and diver friendly small bars and cafés. Each day involved a weather check and dive consultation with other outfits and shops before setting out across the island to the most appropriate dive site for the day. After a rather shakey and cramped, but thankfully short drive, we would arrive at the site for a thorough and informative orientation and briefing. We welcomed the dive guide for the bigger wreck sites and initial orientation, although as experienced UK divers we found the navigation of most sites straightforward, and the conditions good. All the sites we visited were shore dives, but the footing could be slippery, rocky, awkward for less experienced divers, and tiring for the less robust! 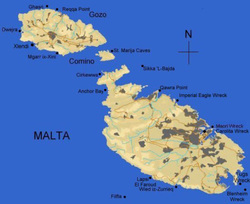 The Blue Grotto is in the South of the island. A popular tourist attraction the grotto is a steep sided gully in the limestone rock that forms a natural harbor. Entry is from the harbor side, and drops you into the centre of richly inhabited walls of soft corals, fireworms, octopus and weeds. Following the Western wall takes you to two small caves, and further round the head to the reference point for a secondary site - the Um El Faroud wreck. The Faroud lies in 36 meters, with the top deck at approximately 25metres. This oil tanker became a dive site following a tragic explosion in dock, resulting in irreparable damage. The ship was removed to its current site. The Faroud is home to vast shoals of Damsels, and the ubiquitous Fireworms. Larger predators such as Barracuda patrol the upper decks. The vessel offers lots of safe swim-throughs, as well as potential for reeling off for a planned deeper penetration into the main hull. 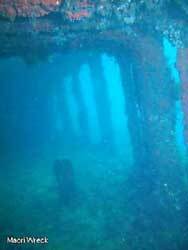 In the photograph (above right) the water is so clear that the wreck actually looks afloat. The decks of Tugboat Rossi (Cirkewwa) lie at approx' 30 metres and we had great viz to inspect the 'sculptural' deck equipment, rigging and winches. The life was still hiding since the high winds, but it was still clearly a rich site. The location is straightforward to navigate but requires a long swim out. Another wreck is the HMS Moari (shown below right). A second world war destroyer which was ultimately responsible for the sinking of the Bismark, intercepting the radio signals which led to its location. The wreck today lies in Valletta harbor in 14m of water, the stern is broken off and missing but the bow is still reasonably intact, lying on the port side and offering some good swim-through's. The scenic dives on Malta reminded us very much of this country, rocky bottoms with sandy patches but with better visibility and more life. For the truly spectacular scenic dives Gozo is the place to go and can be done as a day trip from Malta. We dived the Blue Hole and Inland Sea at Dwejra. The Inland Sea is a large inland pool separated from the sea by a high cliff with access to the open sea along a tunnel approximately 30 m long. Once though the tunnel dive becomes another wall dive, and a good chance to see the seahorses that Gozo is famous for. With daytime average daytime temperatures of 27° C in summer and 13° C in winter and water temperatures of 25° C in summer and 15°C in winter Malta is an all round year destination. We are certainly planning to go back to Malta and dive with Luna again, and have negotiated a really good price package for the autumn season.